As recovering spring breakers are regretting binge drinking escapades, it may be hard for them to appreciate that there is a positive side to the nausea, sleepiness, and stumbling. University of Utah neuroscientists report that when a region of the brain called the lateral habenula is chronically inactivated in rats, they repeatedly drink to excess and are less able to learn from the experience. The study, published online in the open-access journal PLOS ONE on April 2, 2014, has implications for understanding behaviors that drive alcohol addiction. While complex societal pressures contribute to alcoholism, physiological factors are also to blame. Alcohol is a drug of abuse, earning its status because it tickles the reward system in the brain, triggering the release of feel-good neurotransmitters. The dreaded outcomes of overindulging serve the beneficial purpose of countering the pull of temptation, but little is understood about how those mechanisms are controlled. University of Utah professor of neurobiology and anatomy Sharif Taha, Ph.D. and colleagues, tipped the balance that reigns in addictive behaviors by inactivating in rats the lateral habenula. When these rats were given intermittent access to a solution of 20% alcohol over several weeks, they escalated their alcohol drinking more rapidly, and drank more heavily than control rats. "In people, escalation of intake is what eventually separates a social drinker from someone who becomes an alcoholic," said Dr. Taha. "These rats drink amounts that are quite substantial. Legally they would be drunk if they were driving." The lateral habenula is activated by bad experiences, suggesting that without this region the rats may drink more because they fail to learn from the negative outcomes of overindulging. U.S. Forest Service Southern Research Station (SRS) scientists co-authored an article published on March 4, 2014 in an open-access article in the journal Genome Biology that reports the sequencing, assembly, and annotation of the loblolly pine (Pinus taeda) genome. As the primary source of pulpwood and saw timber for the U.S. forest industry, loblolly pine is of great economic importance to the South and to the nation. Dr. David Neale, professor of plant sciences at the University of California, Davis, led the loblolly pine genome project. “The project was a huge undertaking because at 22 gigabases, the loblolly pine genome is about eight times larger than the human genome,” said Dr. C. Dana Nelson, SRS Southern Institute for Forest Genetics (SIFG) project leader and research geneticist. 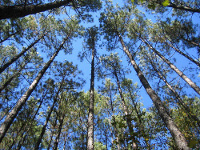 “The group chose loblolly pine both because of its economic importance, and the knowledge gained from 60 years of breeding the species and managing millions of trees in genetic trials.” As part of the project, researchers identified a candidate for a gene involved in resistance to fusiform rust, a disease that infects southern pines. SIFG biological science technician Katherine Smith worked with Dr. John M. Davis, professor and associate director of the School of Forest Resources and Conservation at the University of Florida (UF), to compare mapped sections of the genome with sections found in loblolly specimens previously inoculated with the pathogen that causes fusiform rust. “Fusiform rust is the most damaging disease of southern pines—and one of the most complex, due to genetic interactions between the pathogen and its host,” said Dr. Davis, who also serves as faculty and Executive Committee member at the UF Genetics Institute. Wounds may heal more quickly if exposed to low-intensity vibration, report researchers at the University of Illinois at Chicago (UIC). The finding, in mice, may hold promise for the 18 million Americans who have type 2 diabetes, and especially the quarter of them who will eventually suffer from foot ulcers. Their wounds tend to heal slowly and can become chronic or worsen rapidly. Dr. Timothy Koh, UIC professor of kinesiology and nutrition in the UIC College of Applied Health Sciences, was intrigued by studies at Stony Brook University in New York that used very low-intensity signals to accelerate bone regeneration. "This technique is already in clinical trials to see if vibration can improve bone health and prevent osteoporosis," Dr. Koh said. Dr. Koh and his coworkers at UIC collaborated with Dr. Stefan Judex of Stony Brook to investigate whether the same technique might improve wound healing in diabetes. The new study, using an experimental mouse model of diabetes, is published online on March 11, 2014 in the open-access journal PLOS ONE. The low-amplitude vibrations are barely perceptible to touch. "It's more like a buzz than an earthquake," said Dr. Eileen Weinheimer-Haus, UIC postdoctoral fellow in kinesiology and nutrition, the first author of the study. The researchers found that wounds exposed to vibration five times a week for 30 minutes healed more quickly than wounds in mice of a control group. Wounds exposed to vibration formed more granulation tissue, a type of tissue important early in the wound-healing process. Vibration helped tissue to form new blood vessels -- a process called angiogenesis -- and also led to increased expression of pro-healing growth factors and signaling molecules called chemokines, Dr. Weinheimer-Haus said. Dogs are known to be man's best friend. No other pet has adjusted to man's lifestyle as has this four-legged animal. Scientists at the Messerli Research Institute at the Vetmeduni Vienna, in Austria, have been the first to investigate the evolution of dogs' attentiveness in the course of their lives and to what extent they resemble man in this regard. The outcome: dogs' attentional and sensorimotor control developmental trajectories are very similar to those found in humans. The results were published on February 7, 2014 in an open-access article in the journal Frontiers in Psychology. Dogs are individual personalities, possess awareness, and are particularly known for their learning capabilities, or trainability. To learn successfully, they must display a sufficient quantity of attention and concentration. However, the attentiveness of dogs' changes in the course of their lives, as it does in humans. The lead author Dr. Lisa Wallis and her colleagues investigated 145 border collies aged 6 months to 14 years in the Clever Dog Lab at the Vetmeduni Vienna and determined, for the first time, how attentiveness changes in the entire course of a dog's life using a cross-sectional study design. To determine how rapidly dogs of various age groups pay attention to objects or humans, the scientists performed two tests. In the first situation, the dogs were confronted with a child's toy suspended suddenly from the ceiling. The scientists measured how rapidly each dog reacted to this occurrence and how quickly the dogs became accustomed to it. Initially all dogs reacted with similar speed to the stimulus, but older dogs lost interest in the toy more rapidly than younger ones did. In the second test situation, a person known to the dog entered the room and pretended to paint the wall.